Saturday May 5th 1883 I was busy doing the work all the forenoon Hatt brought Edith over in the afternoon. I was doing some sewing for her. When she went home about five oclock I went to town to order things for tomorrow. I came right back again Ott has company, Mr Free from West Liberty. 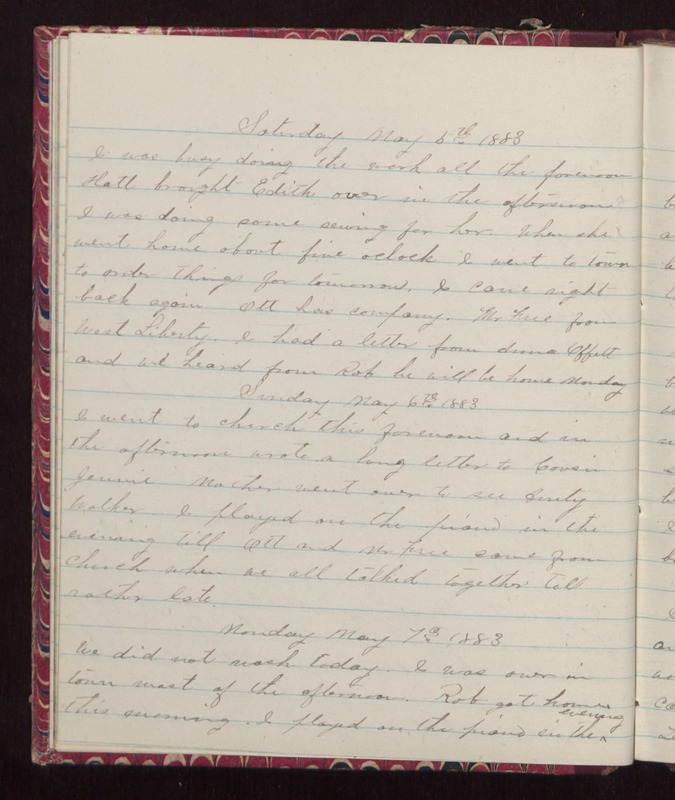 I had a letter from Anna Offett and we heard from Rob he will be home Monday Sunday May 6th 1883 I went to church this forenoon and in the afternoon wrote a long letter to Cousin Jennie Mother went over to see Aunty Walker. I played on the piano in the evening till Ott and Mr Free came from church when we all talked together till rather late. Monday May 7th 1883 We did not wash today. I was over in town most of the afternoon. Rob got home this morning. I played on the piano in the evening.